The World Bank acknowledges there is a water crisis in the Gaza Strip, but it blames overpumping—not the Israeli occupation. For information of Israel’s preemptive pumping of Gaza’s aquifer, see Sustainable Management of the West Bank and Gaza Strip Aquifers (SUSMAQ) report المياه العابرة للحدود (2004) and map Land Times/أحوال الأرضNo. 3 (July 2012). 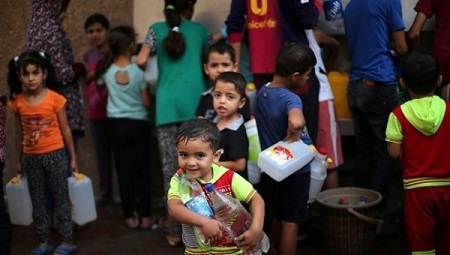 The water crisis in Gaza has become so heightened that the United Nations` 2014 prediction that the region will become uninhabitable by 2020 stands to be true, according to a report released earlier this month by the World Bank. Adnan Ghosheh, a senior water-sanitation specialist at the World Bank, said that irreversible damage has been inflicted on parts of Coastal Aquifer in Gaza, both as a result of overpumping and seawater seepage. “Ecologically speaking, the damage to the aquifer is getting worse, and studies have been showing a steady increase in water salinity,” said Ghosheh, in an interview with Haaretz. Although most of the information in the press release isn’t new—detailing the issue that only 10 percent of Gazans can safely drink the water piped into their homes—it contained a glaring omission. While the World Bank noted the aquifer’s water level has plummeted due to overpumping because of population growth, it does not address the root cause of the water crisis: Israel’s punitive military occupation of the region and its total control of Gaza`s water supply. That’s why a solution that the World Bank, in partnership with the European Bank for Reconstruction and Development and the Islamic Development Bank, is crafting has garnered mixed opinions from Palestinian water specialists. The solution, that is also a part of the Palestinian Authority’s strategy, is the construction of a large desalination plant, which is intended to provide about 55 million cubic meters of water annually to Gazans. While Palestinian water specialists that support the project say it will decrease Gaza’s dependence on Israel, critics argue that beyond environmental damage, that dependence will remain so long as Israel restricts the entry of supplies and material in the region known as an open air prison. In 2009, the World Bank released a report titled “Assessment of Restrictions on Palestinian Water Sector Development,” which assessed the unequal distribution of water in the West Bank. But as Haaretz’s interview with the World Bank’s specialist indicates, the financial institution is now less willing to address the fact that the state of Israel is the root cause of the issue. “Has the World Bank given up on applying pressure on Israel to change its discriminatory policy?” Haaretz’s Amira Haas asked. “Our aim was never to be a mediator, but rather to support the Palestinian people. Our client is the Palestinian Authority, and we are giving it advice as to what is possible and what is impossible,” Ghosheh replied. Photo: A Palestinian boy holding water bottles as other children wait to fill their containers from a public tap in Jabalya refugee camp, Gaza Strip. Source: Reuters.